The podcast has reached a major milestone, and this is the 100th episode of the show! 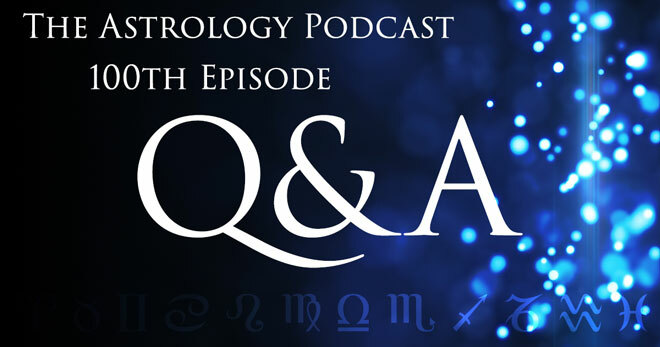 To celebrate the 100th episode we had a question and answer session with astrologers Chris Brennan, Patrick Watson, Leisa Schaim, and Nick Dagan Best. The day before we recorded the episode we put out a call for questions from listeners and patrons of the show, and we ended up with a lot of questions! There were so many questions in fact that we only got through maybe half of them or less in this episode, so we will probably do a followup Q&A episode in April in order to answer the rest. We ran into some technical issues in recording this episode, and were not sure if it was going to be salvageable, but our sound engineer was able to save the day and piece together a full episode from what we gave him. The initial part of the discussion is just between Chris, Patrick, and Leisa, and then about 54 minutes in Nick joined the show. We open the show talking about how it is the 100th episode. Discuss the giveaway prizes for patrons this month, and then the main Q&A discussion gets started at 6:30. Nick joins the show at 54:45. What is the podcast’s theme song? Are electional charts the reverse/mirror image of a horary chart? Which timing techniques do you favor / prioritize? The Tyranny of the Rising Signs: where do you draw the line in applying electional astrology, or astrology in general to your life? Do you use declinations in your practice? How has practicing astrology influenced who you are as a person and your worldview? How would you interpret / reconcile those cases when the MC is in a different sign than the 10th whole sign house? How smoothly did your conceptual transition to using whole sign houses go? How do you approach interpreting the conjunction between a malefic and a benefic? What is the interpretive distinction between inferior and superior conjunctions in terms of synodic cycles? Great episode! I look forward to more of these round table style episodes in the future. It was great to hear a few points on the potential nuances of Zodiacal Releasing… I have both the lot of spirit and fortune in Aquarius ruled by Saturn from the 6th, and I did notice that things didn’t seem to quite line up when releasing from Pisces, but synced up almost down to the day (in some instances) when releasing from Aquarius. It was a little baffling since you’re apparently supposed to release from the following sign when spirit and fortune are in the same sign (at least that’s what I learned). I guess my point is that I definitely agree that there is room for more exploration and research with this method, which has been revived relatively recently. Personally, I find so much room for discovery to be rather exciting. 🙂 Anyway, thanks again and big congrats on episode 100!! That is a good idea! I had always just figured that I could only do one or the other, but now that I think about it I could very well set up a page on SoundCloud as well, and it wouldn’t necessarily cause too many problems. I’ll look into doing that soon. Thanks for the suggestion! Leisa – there is a lot of vocal fry in your voice. You might not be aware of it. Congratulations Chris on your 100th episode! Quite an accomplishment and an example to us all on how we can overcome challenging aspects. Thank you Leisa, Patrick and Nick! Quite helpful to hear your thoughts on techniques, the tyranny of the rising signs, aspects and more. It would be excellent if you continue this kind of discussion with more coaching on challenging aspects and how one can bring them into better balance. I kind of think surrender, letting go and allowing ourselves to be guided by the Universe helps. Part of what traditional astrology has to offer is help in knowing when to accept instead of being given the impression that we can all rise above afflictions and realize big dreams – maybe yes, maybe no. Traditional astrology can help us be more real, find authentic paths and therefore be more content. I’m speaking as a Leo with Sun conjunct Jupiter squared by Saturn in the 5th. My chart is loaded with oppositions, squares and many conjunctions in a combusted stellium – some say a 7 planet stellium. Even though much of my chart trines or sextiles to my MH it’s kind of amazing the conflicted feelings my wiring / insecurities / life experiences create in me. That along with sect and other things. Also it was refreshing to hear Patrick talk about Saturn in the 5th house for both him and his wife as they just had their 3rd child. I love that kind of honest talk. I don’t have children but I do have businesses I’ve birthed. With things we’ve birthed it seems we have to rise above challenges like Saturn in 5th house and find the most positive, fun and fulfilling way to do things otherwise it really is a mess. People with children have little choice, people with businesses can let go but that isn’t a very satisfying remedy. Saturn in the 5th seems to insist on us on being committed, balanced, productive, capable to what we birth? It helps to have intention about having fun with life or to at least chill. Patrick seems to have a fun and joyful expression and that is another good example to astrology fans. What interesting webs we weave. Congratulations!!! Interesting discussion as usual and as usual, prompts to learn more! RE 10th H and MC – My 9th H 28 deg Taurus MC has a strong Venus in Taurus applying to it by three degrees in a day chart. I worked by vocation and avocation in the field of design, and was firstly trained to teach a foreign language, which was a longtime love but not career in the end. Foreign culture played out in both vocation/avocation as an educational and aesthetic influence . I have been studying astrology since I was in grade school many moons ago. More of a mystery to me was the influence of the 10th H ruler, Mercury, and sign on vocation, until I considered Mercury was also the Virgo ASC ruler. A big part of my jobs was to manage other people’s money (Mercury in the 8th), to write, and to counsel. Adding major confusion about life calling, the south node is in the 10th H. Yikes! Point here is that there are many factors that can be influencing the 10th H but I strongly agree that the MC ruler, sign and house placement has an influence from my personal experience, and not until I started using Whole signs did this all finally make sense to me. Having an experience of the divine or the interconnectedness or being transported in a reading. I always enjoy listening to your podcasts, I was particularly eager to listen to this one because declinations were mentioned and I’ve been obsessed with parallels since I’ve learned about them:: I hope to hear more! Seems like it just confirms how little research and attention is put into declination and makes me all the more adamant on focusing myself in that area. It certainly makes its mark yet is forgotten in most charts. In fact I’ve seen parallels to be extremely significant when I’m feeling a person out, like a hidden glue that really brings things together yet is subtle and strong, I’m hoping to be able to find the words to describe my experience when feeling out parallels more, but I always get an “ah ha!” Feel when I discover planets parallel in a chart like it explains the person at a deeper level that’s so obviously apparent than just looking at only longitudal placements. Happy 100, Chris! I can’t thank you enough for the amount of knowledge, influence and inspiration you’ve bestowed upon me during my astrological studies. Keep up the great work. Congrats, again, Chris and team. Great job. Of course, such a milestone deserves a moment of pause and reflection. For me, it’s thinking about my favorite episodes (Geoffrey Cornelius). However, I’d love to hear what you, Kelly, Austin, and Leisa consider your favorites. Maybe you could take some time for before the next episode to consider/review this? Great show again team. I don’t normally comment but it struck me as I have Saturn in the fifth conjunct Mercury in Sagittarius. I then have something in common with both Patrick and Chris. My conjunction ( 1 degree) gives me similar issues to Chris but slightly more extreme as Mercury is in its detriment and retrograde. I also have trouble with pronouncing words and with memory recall. But found Literature and History much easier like Chris. I was diagnosed with dyslexia in my late 40’s which helped explain some of my difficulties. On my first Saturn return I met my wife and had a ready family of four children, after marrying we then had 2 more children of our own unfortunately one of my son’s was born with Cerebral Palsy. He is a great lad and despite some physical difficulties is on his last year of his degree course this September. We also fostered a young boy from the age of 6 who has cerebral palsy and is very physically disabled he is 21 next month and still lives with us! I’m now on my second Saturn return and as Saturn retrogrades I will get another hit. Saturn is out of sect btw as I have a night chart. I would like to say my own children and stepchildren have been a real gift to me and we remain close after nearly 30 years together.